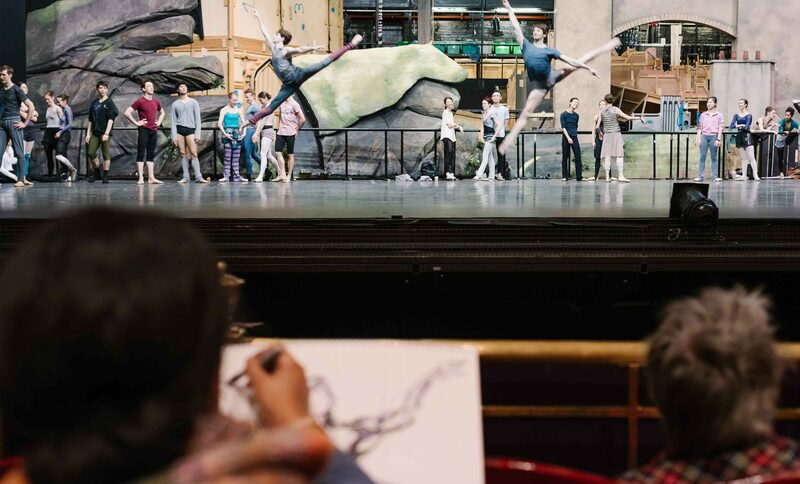 A unique opportunity to draw our dancers in their warm-up on stage at the London Coliseum, and to develop large scale drawings in the studio. This three-part course, delivered in partnership with CityLit, concentrates on the challenge to interpret rapid movement into mark-making to communicate the dynamic of the dancer’s body through space. Participants will explore a range of fast sketching techniques to produce an intuitive response that has immediacy and directness and to reflect on the relationship between drawing and movement. Emphasis will be on capturing rhythm, fluidity and spontaneity of dance and expressing this in either figurative or abstracted drawing. Throughout the course, participants will consider the wider context for the dynamic figure in art to seek inspiration from the work of a range of artists. Studio-based work will encourage participants to experiment with media and techniques through project work including collage and ‘unorthodox’ drawing tools for ‘action’ and expressive mark-making. The studio will be a place to ‘work out possibilities’ – the challenge being the translation process from the initial raw sketches to more resolved art work. This is not a beginners course. Some life drawing experience and/or at least Drawing One is advisable.